The Basalt High School football team beat Moffat County 33-13 on Saturday, Sept. 29, 2018 in Craig. CRAIG — The Moffat County High School football team’s Saturday afternoon homecoming matchup with Basalt ended in 33-13 loss to the Longhorns, a result that was a mix of good and bad for the Bulldogs. The MoCo Hoco energy provided an immediate boost for the Dogs, who kicked off to start and other than a 30-yard reception by Longhorn Dawson Hodgson, the Bulldog defense stopped the opening drive cold. With an undefeated record this season combined with a defense that had only allowed six points, Basalt’s reputation was on Moffat minds but not enough to intimidate them as they took over. A little bit of luck and a Longhorn offsides call on fourth down got the Dogs into enemy territory, and no sooner were they in the red zone when Colby Beaver found Cale Scranton from 18 yards for the first score. Basalt’s shock at being behind for the first time this season helped them deflect Joahan Quezada’s extra point kick as they readied to get back in gear. MCHS was soon down a man when lineman Bryson Davis limped off the field with a knee injury, while the Longhorns had enough small gains to stay ahead of the chains, ultimately finishing with a counter play by Jake Reardon from seven yards out to the goal line, adding a PAT to boot to make it 7-6. A Bulldog push to retaliate didn’t go anywhere, but the blue boys locked down Basalt at midfield with batted-down passes and more, including a sack of quarterback Trevor Reuss by Scranton to end the first quarter. Neither side scored in the second quarter, but it was far from dull with plenty of turnovers, starting with Scranton stripping the ball from Reardon as Kevin Hernandez recovered the fumble. In the air, Bulldog Dagan White gained his fifth turnover in as many games with a deep-coverage interception of Reuss, while Beaver was quickly picked off by Basalt’s Rulbe Alvarado. The invigorated home team returned the second-half kickoff and stayed stuck at the 45 from there, with a punt into the wind giving Basalt extra yardage. The Longhorns swiftly getting the ball rolling as Reardon scored again from five yards. He added another touchdown from 17 yards out late in the third quarter, while the Moffat County offense started to implode with a disastrous drive that saw Beaver sacked twice in a row as the Bulldogs went backward and Hernandez barely got off the punt from within his own end zone. The Longhorn lead kept growing as Reardon scored all five of the team’s touchdowns with 227 total rushing yards, but the Moffat County defense started clicking again late in the game as Victor Silva snatched a midfield pass from Reuss for the interception and Beaver whipped it to Scranton and Josh Teeter for quick gains, with Scranton scoring again to get the team into double digits. “That third quarter really kicked us in the pants, but the guys really came out strong and played their tails off,” MCHS coach Jamie Nelson said. In RPI rankings, Basalt was third in Class 2A going into the day, the highest placement for the conference, a status that didn’t escape Bulldog coaches. Despite Basalt’s tally — now 5-0 overall — the Bulldogs are the first team this season to score more than once vs. them. While not too concerned with the score, Basalt coach Carl Frerichs noted that every week is a battle in the campaign to get to the playoffs, and despite missing several starters the squad was able to adjust after being caught unaware. “We were really on our heels in the first half. Then they really came out and played well in the second. Coach Nelson did a great job — they were prepared and had a good little defensive scheme,” Frerichs said. 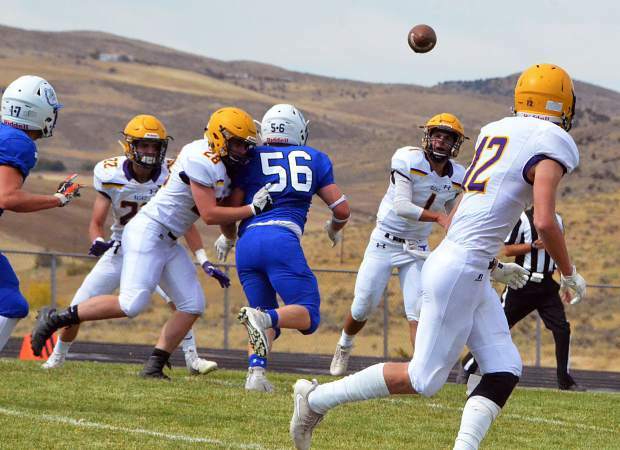 While Basalt has spoiled two consecutive homecoming games — shutting out Paonia 16-0 the week before — the Longhorns will return to their own school pride game, hosting Coal Ridge on Friday. The Titans look to recover from a 36-8 loss to Rifle.